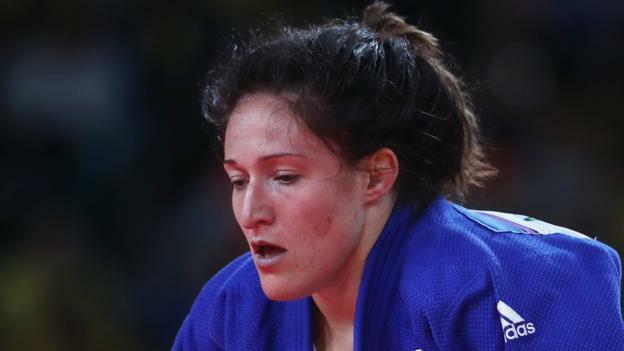 Natalie Powell has suffered a shock third round defeat at the World Judo Championships in Azerbaijan. The 27-year-old – ranked world number two in the women’s -78kg class – lost in Baku to Slovenia’s Klara Apoteker, who was ranked 14th. “I messed up, I just messed up,” Powell told BBC Sport Wales after the defeat. “I haven’t had a chance to think about it yet, for a few months things have been going well, I didn’t have any issues. I just lost. Powell won bronze at last year’s World Championships for Great Britain and had hoped to become Wales’ first world judo champion at this year’s event. But her hopes were ended in a matter of seconds by her Slovenian opponent. Powell, of Builth Wells, was thrown for ippon to end a day that began with a comfortable win earlier in the day over Gabon’s Sarah Myriam Mazouz. Britain’s Jemima Yeats-Brown narrowly missed out on a bronze medal at her first World Judo Championships in Baku. The 23-year-old from Kent – ranked 57th in the world – had beaten the reigning European champion on her way to a bronze medal match against Dutch 2009 world champion Marhinde Verkerk. Neither fighter registered a score in the four-minute fight, but Verkerk – ranked 7th in the world – won by ippon after throwing Yeats-Brown in golden score. Yeats-Brown had only just moved up to the -78kg class, after fighting at -63kg and -70kg previously. This result places her fifth overall. “I loved the experience but to come so close to a medal and not get anything is a bit hard,” Yeats-Brown told BBC Sport. “They (her opponents) are bigger than me and stronger than me. But they haven’t got as much fight as me. That’s what gets me through.